Living expenses for one month is about 65,000~80,000JPY, either private apartment or student dormitory. Student who wish dormitory, please contact us. All students become members of “national health insurance”. After becoming member, hospital expense for injure and sick pay 30% of real expense. You ask to issue “Permission of Activity for Non-qualification” (“sikakugai katudou kyokasho”) to Immigration Office. Then you can work regally. But you can work less than 28 hours weekly. Furthermore you cannot work any prohibited jobs by law. The school staff who has the qualification of “application agent” of the immigration office, advise the student about the preparation of documents and how to fill out when the student must procedure during the stay in Japan, and apply instead of the student. Our school is located in very convenient place where takes 10~15min. 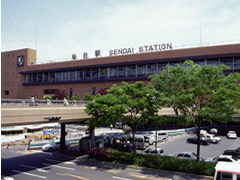 on foot from JR Sendai Station, Subway Sendai Station, Subway Kotodai koen Staion. Further, there are Banks, Convenience store, Post Office, Super Markets, Hospital, 100en Shops, etc. around school. ※Use of this website of telephone and fax number can directly contact with us for application Or others.